EXCELLENT - This Reading Flash Card 4-pack contains 4 sets of flash cards. The flash card set includes one each of the following: Sight Words, Phonics Made Easy, Word Families, Picture Words and each flashcard set has 56 full-color cards per title. Combining letters, pictures, sounds, and small words starts your child's big adventure in reading! Four colorful flash card sets in this one little package offer 4 times the learning! They're perfect for home and classroom. These sets are intended for children ages 4 and above. Prepare your child for reading success with these flash cards from Flash Kids! Sight Words Flash Cards will help your child become more familiar with over 150 sight words. The set of cards also includes ideas for games and activities to make learning easy and fun. Flash Kids educational products focus on fast, fun family learning. Developed for children in grades K–8, theytake a lighthearted approach to serious educational content. In an age of rigorous standardized testing and increased emphasis on performance, Flash Kids encourages parents and children to enjoy the simple delight of learning new things together. Most importantly, Flash Kids products give families an easy, affordable way to bridge the gap between school and home. Help your child master key sight words, and watch as their confidence with their reading and writing skills soars, with this fun and effective wipe-clean workbook. Inside, there are practical, step-by-step exercises to help kindergarten and First Grade children learn to sight-read, write, spell, and use 50 essential high-frequency words. Also included is a special pen and the activities can be completed, wiped away, and repeated. There are pull-out, double-sided flash cards, too, featuring all 50 sight words, as well as blank cards for individual learning. Brighter Child® Sight Word Flash Cards offer children a fun and easy way to practice over 100 basic words and phrases most frequently used by beginning readers. The set features 54 cards that help strengthen phonics, letter recognition, and reading readiness skills. Charming full-color illustrations help to engage children, and a special card also offers creative game ideas designed to reinforce learning. EXCELLENT - See it, say it, learn it! Ellos ven, ellos dicen, y ellos aprenden! These sight word flashcards are a great way to help your child learn English and Spanish while making it fun! Our bilingual flashcards are perfect for teaching kindergartners and others strong skills in sight words, early reading, and Spanish-English vocabulary. These fun, colorful flashcards feature bright, bold text that will help kids with basic words in two languages frequently found in beginning reader books. 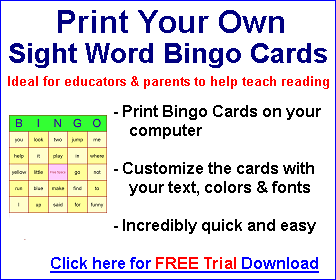 The Parent Card includes games and activities to supplement the 110 sight words in the deck. These are wonderful learning tools for at home, on the go, and the ESL or language immersion classroom, as well as for anyone bridging two languages. RESULTS - Our learning materials have helped educate three generations of kids, creating lifelong learners, and the legacy continues. Digital content, flash cards, workbooks, readers, toys, and games are all crafted through a child's eyes while integrating parent and teacher standards.